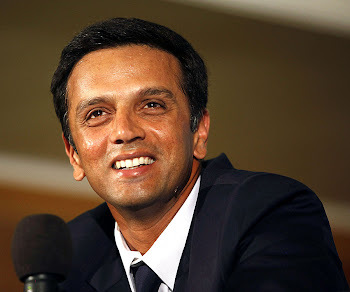 Rahul Dravid: "I go out and do other things to take my mind off the sport"
"I go out and do other things to take my mind off the sport"
Rahul Dravid believes in pursuing excellence without the stress of competition. He spends hours practising and finds the experience meditative. "My wife feels it's my escape from reality," he smiles and adds, "When you are practising, you don't have to worry about what's happening at home and when you are depressed or down, it has the same effect as meditation." Rahul recently shared the stage with Abhinav Bindra to discuss the ace shooter's new book. "The struggle of a sportsman on the road to success has been brought out well in Abhinav's book. I find resonance with that. This book is a great achievement for someone so young," points out Rahul. And The Wall confirmed that it's a challenge to stay rooted in the present. "There have been times when I have clinched the game in a moment," says Rahul, adding, "It happens at those times when I have the ability to perform, irrespective of my state of mind." But it's important to stay in form. "Form too, is a mental state. When you reach the right space, magic happens. When magic happens, there's joy in the journey towards excellence," points out Rahul. And he doesn't go around trying to be a role model. "Cricket is just something that I am good at, just like various people are good at various things. What's lucky is that cricket gets enormous publicity," says the cricketer. So with its coffers brimming, should the BCCI support other sports? "To be honest, what Abhinav and others like him have achieved has generated a lot more interest in people about other sports. There's no point in comparing cricket to other sports. It's just that cricket has been lucky," says the ace cricketer, who has three consecutive centuries to his credit. But Rahul points out that he's not really after numbers where making centuries are concerned. "I also try to be who I am. So I go out and do other things to take my mind off the sport," he says. Rahul also feels lucky to have found books. "Reading allows me to recharge my batteries," he says. And being the dedicated, self-disciplined achiever that he is, Rahul would probably be playing golf if he hadn't found cricket. "I say golf because it's a sport you can master without much help from others," concludes The Wall. Many many hapy returns of the day.. Happy birth day.. May god bless you & all the dreams come true.. May time bless you with more good health wealth and opportunities.. Always your loyal fan.